Bamboo plants have a special and unique appearance that adds a special touch to the garden. They are also fast-growing plants that can be used for screening, especially in narrow spaces, since some can grow very tall without taking up a lot of room. Because of their unique structure they do need some special care to grow well, but succeeding with bamboo plants is easy for anyone. It is important when buying a bamboo plant to choose the type that is best for your purpose. That way you will know what kind of care it needs too. There are two kinds of bamboo plants, clump-forming and spreading. Clump-forming types produce their new growth close to the base of the plant, so they are dense and bushy and only spread very slowly into surrounding areas. Good examples of clump-forming bamboos are Multiplex Bamboo and Sunset Glow Bamboo. If you are looking for a plant to bring that special ‘bamboo’ look to your garden, or a bamboo for a planter, choose a clump-forming type. The second type of bamboo is the spreading type. These have underground roots that send up new shoots some distance from the original plant. These can cover a large area quickly, so they are ideal for screening and background plantings. There are several ways of managing and controlling their spread. Multiplex Bamboo and Black Bamboo are two very attractive and useful spreading bamboos. If you want to give your bamboo plants the best care, start by putting them in suitable spots in your garden. Most bamboos grow best in full sun or partial shade. Some types are more shade-tolerant and most types will grow in shade but they will not be as vigorous. Bamboos do best in richer soil and need regular watering during the spring or they will not grow as tall as they can. When grown in poorer soil they will often stay more compact, which can be a benefit. Some bamboo plants can survive cold winters, others need warmth, so when choosing your bamboo plant, check that it will survive in your climate zone, unless you have somewhere well-lit to keep it during the winter months. If you are planting your bamboo in a container, make sure it has a drainage hole and that it is wider and deeper than the pot your bamboo is in now. Use a regular potting soil – one blended for outdoor planters is best – but ordinary house-plant soil is also fine to use. Before planting, dig the spot thoroughly, removing the roots of weeds and any large stones. Add some organic material to the soil and some bone meal or superphosphate. Water your plant well during planting and at least once a week for the first year. Once established, most bamboos are drought-resistant for a least a few weeks, but try to water them from time to time if you can. Plants in containers should be watered once the top couple of inches of the soil is dry. Water the pot frequently during the growing season and less during the winter months. Put mulch around your plant in late winter or early spring, before the new growth appears. Use rich organic mulch that will feed your plant. A granular fertilizer for evergreen hedges makes a great bamboo food too – apply it in spring just before you mulch and again in mid-summer on top of the mulch. In containers, and also in the garden if you wish, use a liquid fertilizer for hedges or foliage plants. Apply according to the directions once a month or at half-strength every two weeks. Most bamboos have few or no serious pests or diseases, but some can rot if grown in soil that is too wet. Spraying the foliage during hot weather will help discourage any pests that may arrive on your bamboo plants. Bamboos grow by sending up new stems from the ground. When these are almost fully grown they then send out leaves. Stem live for several years but eventually they may become ragged and unsightly. 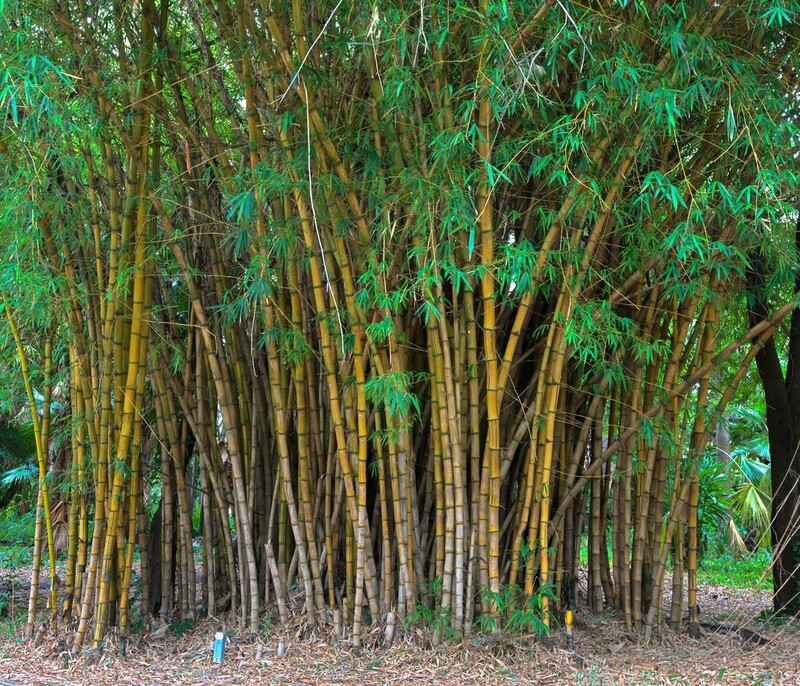 If this happens, or if your bamboo is too dense for you, remove older stems right at ground level. If the stems are too tall, clip the top at the height you want them to be. This is all the pruning your bamboo plants should need. Never use pruning shears or hedge-cutters on the leaves as they will not grow back. Spreading bamboos are great plants for screening and filling large areas, but sometimes they can spread too much. There are two ways to control them – by root-pruning or by installing a barrier. Root-pruning is an easy way to control the spread of your bamboo plants, but it must be done once or twice a year to be effective. In spring when you see new shoots forming, take a sharp spade and cut through the underground stems by pushing the spade right down into the ground more or less vertically. Work around your clump, or along the row, cutting through all the stems at the point where you want the bamboo to stop. The take your spade and dig out the root pieces outside your line. These pieces can be transplanted to where you want more plants and thicker growth, or just discarded. You may need to repeat this towards the end of summer if you see more shoots coming up. Making a barrier is another way to keep your bamboo plants where you want them. If you are doing construction while building your garden, you can make a narrow trench two feet deep around the area you plan to plant your spreading bamboo and fill it with concrete. An easier method is to use barrier fabric placed in the ground around your planting area. This should be 24 to 30 inches deep and come up 2-3 inches above the ground as well. Do not use regular landscape fabric, since most of the larger bamboos can push through it. Instead, use thick high-density polyethylene fabric recommended for bamboos. Bamboo plants are beautiful and special plants, as well as being great landscape features or easy-care screening plants. With some basic care they will reward you with vigorous, healthy growth that will enhance their best features. These special plants have a place in every garden. Are bamboo plants pollinated by bees ?